The 16' octagon is the ultimate trampoline with the largest jumping surface of all our trampolines and one of the largest on the market. It is a very heavy-duty trampoline - only 4 top-rails constructed from 13 gauge steel, 1.9" in diameter, plus 4 one-piece legs. The 16' Octagon Magic Circle Trampoline was designed for the safest of outdoor use with virtually no maintenance for years of safe family fun. The 16' octagon is the ultimate trampoline with the largest jumping surface of all our trampolines and one of the largest on the market. It is a very heavy-duty trampoline - only 4 top-rails constructed from 13 gauge steel, 1.9" in diameter, plus 4 one-piece legs. The 16' octagon has 112 springs, 14 on each side. Each side has its own safety pad attached to the first and last spring. You have your choice of purple, yellow or green safety pads. 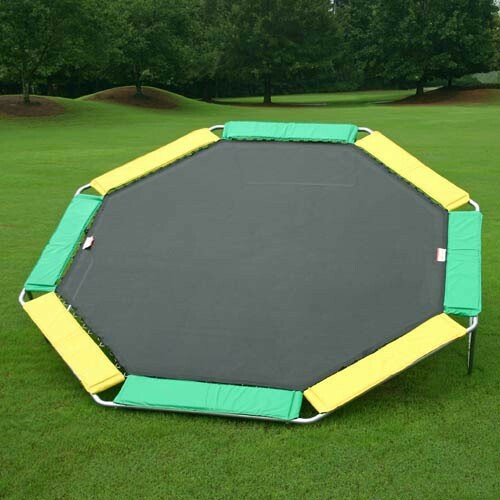 All Magic Circle Trampolines have a weight limit of 450lbs. – the highest in the industry.